First and second-year Tepper students recently attended the Reaching Out MBA (ROMBA) conference in Minneapolis. One student reflects on the power of LGBT spaces in MBA programs. On October 11, 2018, the LGBT community will mark the 30th anniversary of National Coming Out Day. While there have been some significant improvements in how LGBT people are treated in society, National Coming Out Day is a reminder of the power and significance that coming out has in the community. As an out gay man and a first-year MBA student, I’ve often contemplated what role, if any, my sexual orientation has on my career and place in the workplace. 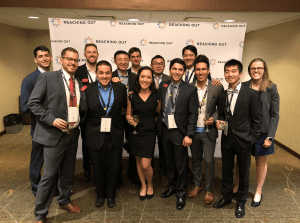 In addition to clubs like Out&Allied organization, Tepper is also a member of the Reaching Out MBA (ROMBA) consortium, a group of top-MBA school LGBT students and alumni exploring LGBT issues in business. Being LGBT in the work place: The conference featured talks from business leaders focusing on issues like the value of the Pink dollar, organizing employee resource groups (ERG) in the workplace, how to address discrimination, and more. Network with top companies looking for LGBT talent: Additionally, the conference provided first and second-year students with an opportunity to network with recruiters from elite consulting companies, banks, tech companies, CPG firms, non-profit organizations. Connect with other LGBT MBA students and alumni: Finally, ROMBA provides LGBT students with the ability to network with one another. It’s rare in business to encounter such a large gathering of future gay leaders. ROMBA was an excellent opportunity to meet those who will be leading organizations in the future. Coming out of the conference (pun intended), I have a few thoughts on the power of groups like Out&Allied and ROMBA. First, although there has been some discussion in the LGBT community around the continued value of coming out and LGBT-specific spaces, ROMBA reinforced for me the importance of LGBT organizations in business. When I met another ROMBA attendee, I immediately knew that we shared at least one thing in common. From this shared identity, we could build a meaningful professional relationship. 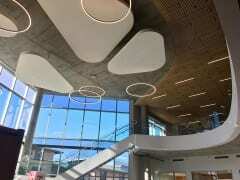 It’s striking to me how easy it was to start a personal and productive conversation with a fellow LGBT at ROMBA. Conferences like ROMBA help LGBT people see themselves as leaders who can bring their whole selves to the workplace. Additionally, it’s striking to me how otherwise ordinary stories still feel transformative when put in an LGBT context. To illustrate – the actor George Takei was the keynote speaker at the conference and delivered a rousing call-to-action. While his speech was incredibly motivating, I was struck by the power of a more personal part of his talk. When George shared how proud he was to marry his husband, he had the rapt attention of everyone. I love going to a friend’s wedding as much as the next person. I can’t say though that I’ve ever been as moved by a wedding anecdote then I was hearing George speak about his marriage. It was this moment when it made me realize how rare such a story was. Gay marriage is a relatively new phenomenon and it still has the power to amaze and transfix a gay audience. Similarly, LGBT leadership in business remains unheralded and rare, and the Tepper MBA’s at ROMBA aim to change that. Oh My!!!! 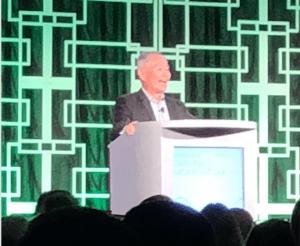 George Takei delivers the keynote speech at ROMBA 2018.
Business schools like Tepper are incredibly welcoming places where students feel confident sharing all the layers of their identity. This isn’t the case in all businesses, and LGBT leadership in the world’s largest organizations remains thin. Leaders like Tim Cook at Apple and Beth Ford at Land O’ Lakes are great pioneers. Nevertheless, there is still a need for LGBT leadership to ensure that all places of business are welcoming. If you’re thinking about pursuing your MBA and you’re LGBT, make sure to look at ROMBA and Tepper. They could both be instrumental in accelerating your business career. Director of Product Marketing at PipelineDeals Inc.
David is a 2020 MBA candidate at the Tepper School of Business seeking a product management position in tech. Before business school, David led the marketing team at a B2B software startup in Seattle, WA and he was a Teach For America corps member in Colorado. Outside of work, David is an avid runner, cyclist, hiker, and camper. He is an active fundraiser and bike-rider for AIDS/LifeCycle, a 545-mile bike ride from SF to LA that supports the SF AIDS Foundation and the LA LGBT Center. His AIDS/LifeCycle team is the Pork Peddlers — united by bacon to end AIDS. He’s a little too obsessed with his tuxedo cat Figaro.